We have one of the largest selections of skate equipment on the web, a super knowledgeable staff and expert guides to help you make an informed decision. There’s a lot more to longboards than meets the eye. Longboards come with different shapes, construction, and features, and they’re designed for various riding styles and abilities. So we’ve created this guide to take the guesswork out of longboard selection and get you on the streets as fast as possible! Grab some juice and pretzels, take a seat, and read and learn about longboards. Then shop for longboards and GO LONGBOARDING! What’s your ability level? There are longboard shapes, styles and setups that are specifically designed for each level of riding. It’s important to be realistic in assessing your level of shred to make your riding experience more fun and progression a breeze. A board’s shape, mounting type, and flex depend heavily on your style of riding and your ability. Each section within this guide will discuss what features are best for each ability level. Within longboarding there are different styles of riding. Whaaa? Yep, there are! Whether you want to cruise campus on the way to class, bomb the gnarliest hill you can find, or session a drainage ditch or park, different boards can make all of these things possible. Take into consideration where you live. If you reside in eastern North Dakota, you probably won’t be bombing too many hills, and if you live here in the mountainous PNW, you’ll most likely be hitting hills, flats, and everything in between. Keep this in mind. Cruising and carving are all about carving down gradually sloped streets, ripping through the quad on your way to class, and long distance pushes on flat or slightly sloped ground. If you’re just getting into longboarding, this is most likely the type of riding you’ve either already done on your friend’s board or what you’ll start doing on yours. Downhill longboarding is all about bombing hills as fast as you can while maintaining control. You are usually in a crouching or tucked position on your board for reduced wind-resistance and increased stability. Just like in freeriding, it’s not uncommon to break those wheels out in a slide to control your speed, so true downhill isn’t the best style of riding for brand new riders. Freeride longboarding means that you are riding hills with a fair amount of speed while styling it up with slides and curb hops, as well as sliding to control your speed on bigger descents. This style of riding requires quite skilled board control and comfort at high speeds, so it’s typically reserved for more expert riders. It’s all about being creative, so you can pretty much ride whatever you want. Freestyle riding involves many technical skills such as sliding, board tricks, regular and goofy riding, and dancing, just to name a few. This type of riding is a good way for beginners to learn board control skills, but it’s also extremely enjoyable for advanced and expert riders. There are two general board shapes that all other designs fall into. Both board shapes are beginner and expert-friendly. These boards are only meant to go in one direction: forward. The most popular directional board design is the famous Pin Tail, which doesn’t provide proper board feel or control while ridden switch. Carvers, cruisers and downhill boards are usually directional but there are some exceptions. A symmetrical board looks and feels the same regardless of which way it is facing. If you plan on doing any 180° slides (common in freeriding and freestyle), a symmetrical board is the way to go. Deck styles play a key role in how stable the board is, how easy it is to foot-brake, and how easy it is to push on flat ground. As a general rule of thumb, the higher the board is off the ground, the higher the center of gravity will be, which translates to less stability and more fatigue while pushing and foot-braking. On the other hand, the lower the board is, the less leverage you have to toss quick carves and the more likely you are to bottom out on tight turns. Top mount is the most traditional board shape in longboards, and it is also the least expensive. The deck is mounted above the trucks so the center of gravity is higher than on the other board styles. This makes the top mount slightly less stable but more nimble than dropped boards because of increased turn leverage. Top mount boards are the most versatile and can be used for cruising, carving, downhill, freeride and freestyle. On a drop though board, the trucks are mounted “through” the board, which effectively lowers the deck height by the thickness of the board. This increases board stability and reduces fatigue while pushing/braking because you have to drop your foot less to contact the ground. These boards are great for long-distance riding (commuting), freeride and downhill riding styles. These decks are the weird-looking ones. They are molded during construction in such a way that the area your feet chill on sits below the truck areas of the board. This is a very effective method for lowering the center of gravity for increased stability and less fatigue while braking/pushing. The amount of drop is usually dictated in inches (ex. “0.625 inch dropped riding platform”). The drop deck style is typically found on downhill and some freeride boards. Drop deck boards top mount their trucks. Lower than the lowest bar at limbo, double drop boards feature both drop through trucks and the drop deck style to get your feet as close to the ground as possible ("double" drop). This is the most stable deck style, but it is also the least common due to its high degree of difficulty to construct, which can also make it the most expensive. This shape is generally only found on dedicated downhill boards. All boards come with certain shape features that provide specific riding characteristics and help dictate each board’s intended use. These features include kick tails, wheel cut-outs, and concave. Kick tails are what you see on both ends of regular skateboards. They allow you to lift one end of the board off the ground to perform tricks or hop curbs, as well as make quick turns. 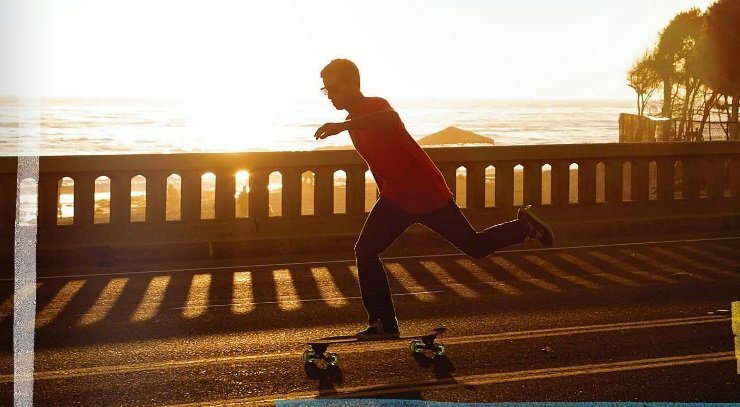 Longboards can have kick tails on just one end (on directional boards) or on both ends (on symmetrical boards). They are great for cruiser boards for last second pedestrian dodges and curb hops, and a necessity on many freestyle boards. Both wheel cut-outs and wheel wells are all about preventing wheel bite, which is what happens when you corner too hard and your wheels contact your deck. This usually results in you getting thrown off your board (no bueno). Cut-outs generally allow you to turn the hardest because there is no way for the wheels to make board contact. Wheel wells allow you to turn sharp but will still allow for contact if your trucks are too loose, you don’t have large enough risers, or your wheels are too big. Grip tape keeps your feet on the board, but concave helps quite a bit, too. Concave essentially means that the edges or rails of the board are a little higher than the board’s center. When standing on the board, your feet will contour to this shape, increasing the contact area of your shoe, which in turn means more grip. The amount of concave usually depends on the designated riding style of the board: Downhill and freeride boards generally have deeper, more extreme concave than cruisers. Just like regular concave, W-concave keeps your feet planted on the board. It’s actually like having two concave sections next to each other, which provides a lot of grip. This feature usually only comes on more expensive downhill and freeride boards. Board length or more specifically, wheelbase length, plays a key role in turning and board stability. Longer boards (or those with longer wheelbases) will generally provide more stability at speed, but cannot turn as fast or as tight as boards with shorter wheelbases. The most common and inexpensive board construction uses multiple thin sheets, called veneers, of maple or Baltic birch wood much like traditional skateboards. The veneers are glued, stacked on top of each other, and pressed into shape. The number of veneers varies between boards, but a general rule of thumb is that the more veneers used, the stiffer and heavier the board will be. Bamboo laminates are also gaining popularity in the longboard world. A sheet of vertically laminated bamboo is wrapped or sandwiched in fiberglass or other composite materials. This typically produces a medium to lightweight board with a soft to medium flex and powerful spring-like characteristics. The third and most expensive construction utilizes composite materials such as carbon fiber. A lightweight wood such as bamboo is usually combined with a piece of foam to create a very light core that is then wrapped in a composite material to add rigidity. These boards are known for their stiffness and light weight, making them desirable for serious downhill riders. Boards come in oodles of different flex ratings, which are dictated by many factors including board material, laminates, length, and amount of concave. The chart below provides information about what degree of flex is good for each style of riding. Soft Excellent shock absorption on rough roads. Very unstable at medium to high speeds. Fun for mellow cruising and certain board tricks. Medium Maintains stability at speed. Provides a spring like feel that can add energy to pushes and carves. Provides good shock absorption over bumps. Great for carving, moderate speed cruising and commuting. Stiff Most stable at moderate to high speeds. Least forgiving on bumpy or cracked pavement. Best for bombing hills, going fast and freeriding. The trucks attach the wheels to the deck and allow for turning and pivoting on the axle. Longboard trucks differ from those on normal skateboards in that they have a reversed or inverted kingpin. This provides a more side-to-side movement for better stability and control. Just like skate trucks, however, these can be adjusted to how easily they pivot. Tightening the nut on the kingpin compresses the bushings and creates a stiffer feel when turning. Looser trucks are better for turns, while tighter trucks are better for high speed stability. Changing the hardness or durometer of the bushings will also change how the trucks will pivot. The baseplate is the part of the truck that is connected to the board via the four mounting hardware bolts. The hanger, which pivots on the baseplate, is the part of the truck that acts as the axle, holding the wheels in place. 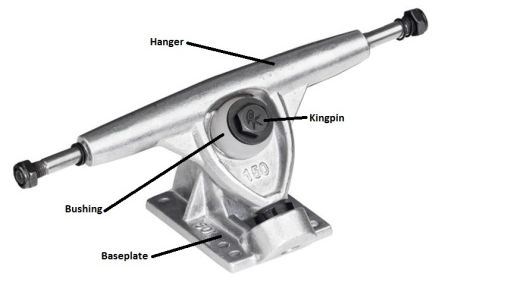 Bushings are the rubber pads between the kingpin, baseplate and the hanger on a truck. There are two bushings per truck. Harder bushings are tougher to turn on but return more energy, giving a springier return to center or more resistance for pumping. Softer bushings absorb energy and impact, making turning easier. Tightening your trucks, via the kingpin nut, can also play a major factor in the type of ride you will have. Top Mount, Drop Deck and Double Drop boards have their trucks mounted in the traditional style that is seen on normal skateboards. It’s important to note, however, that Drop Through decks require an extra step to install or remove the trucks. In order to remove or install the trucks, the hangers must be removed. To do this, simply loosen the kingpin nut all the way, remove the top bushing, and the hanger should come free. Now, once the normal mounting hardware is removed, the baseplate can be removed or inserted into the top of the board and the bushings, hanger and kingpin nut can be replaced. Wheels play a huge role in how your board preforms because they provide grip between you and the road, which affects speed and cornering ability. There are several different factors that dictate how the wheels will perform. These factors are shape, width and height, durometer and core style. Each factor is discussed below, followed by a chart to show which of the following features are best for each style of riding. There are two shapes that wheels, or rather the lips of the wheels, can have: round and square. Round lipped wheels are what you see on normal skateboards. The “edge” of the wheel is rounded, which provides less traction through turns. This means that they are easier to slide on than the square type, making them the clear choice for freeriders and freestylers. 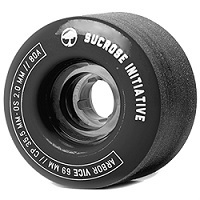 If you are new to longboarding or want to bomb hills and rail corners as fast as possible, look into square lipped wheels. Square lipped wheels are the typical longboard wheel shape. Instead of the “edge” of the wheel being rounded, it’s, yes, square (at a 90° angle). This provides better contact with the road, which in turn provides much more traction and sliding resistance. Square wheels can still slide once broken in, making them excellent for downhill and cruising/carving. The width of the wheel is the distance from the outer to inner edge of the wheel, or can sometimes be measured by the wheel’s contact patch. A wider wheel will generally offer more grip but will also be slower due to its increased contact with the ground. The height (also called diameter) of the wheel is the distance between where the wheel touches the ground to the top of urethane, in a straight line. It is usually listed in the name of the wheel and is measured in millimeters (ex. 75 mm / 78a). Larger wheels will offer a smoother ride because they can roll over cracks and obstacles with less effort, but they will also make for slower acceleration. Smaller wheels accelerate faster, but they increase the risk of you getting bucked off your board if you hit a large enough crack or piece of debris. Durometer tells you how hard the wheel is. It is listed in the name of the wheel, and is followed by a letter (usually either “a” or “b”) (ex. 75 mm / 78a). This letter explains what scale was used to measure the wheel. “a” wheels are made of a softer, more rubbery material, while “b” wheels are more of a hard plastic. The lower this number is, the softer and more rubbery the wheel will be. Soft wheels provide more traction and are better on rough pavement but are also slower due to more friction with the ground. Harder wheels, or those with higher durometer ratings, will have less friction, which makes for a rough ride on bumpy pavement, but they are also faster and easier to break out into a slide. Generally, beginner/intermediate riders should look for softer wheels in the 75a – 80a range for the best grip. The core is the center of the wheel, and it’s what houses the bearings. There are three different types of cores: centerset, offset, and sideset. Centerset is found on most sliding and skateboard wheels. Its symmetrical design allows the rider to flip the wheels around once one side becomes worn, which effectively prolongs the lifespan of the wheel. Offset cores are located off-center, closer to the inside of the wheel. This offers a nice balance of grip and slide-ability. Sideset wheels have their cores located very close to the inner lip of the wheel. This offers great slide-ability due to the minimal urethane on the inner lip, but they cannot be flipped once they become worn. Simply put, bearings are what make your wheels spin. They are typically rated by a standard called ABEC, and the higher the ABEC rating, the faster your wheels will spin. Generally, ABEC 3 bearings are good for cruising, ABEC 5 is good for freeride, and ABEC 5–7+ bearings provide maximum speed for downhill and racing. It’s very important to perform regular maintenance on your bearings. This will help maintain them for optimum performance and durability. To do so, simply remove your bearings, clean, re-lube and re-install them. We recommend doing this after every 50 hours of riding (more or less) with a product such as Bones Speed Cream Bearing Lube. (Do this much sooner if you ride in the rain or through a puddle; water will cause bearings to prematurely rust.) NEVER USE WD-40! WD-40 and other household “lubricants” will actually dry your bearings out and reduce their performance and lifespan. *Do not over-tighten your bearings during installation. This can severely damage them. If the bearings start to feel “crunchy” you’ve gone too far and need to loosen them.